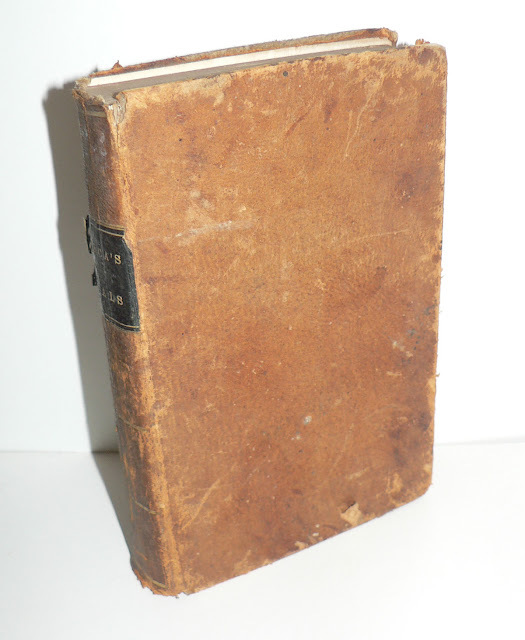 Giving away this 1839 leatherbound copy of Seneca's "Morals: By Way of Abstract." Rear cover is a bit loose, otherwise this 173 year old text is holding up nicely. Wow! That's one very pretty book! count me it!!! :D hope i win!!! That book is beautiful! I absolutely love owning old books. Would love to add it to my collection! Wow, how incredible is that book? Good luck to everyone! I love it! That's an absolutely amazing book! So lovely! What is it about old books that makes me grin? Whatever, that looks positively cuddly. Lovely book! It would look beautiful in my house. Awesome! I would love to hold that book in my hands! Thanks for the give away! Looks lovely! Anybody would be lucky to have it. I'm ready to receive new old morals! Oh yes, oh yes, me want. Very cool. I know someone for whom that book would make a great gift. How lovely!! Would love to win this! That looks amazing! count me in! How very neat! My oldest at present is from the 1860s, so this would be a record-breaker... thanks for the chance! Me! Please, me! I just started college and I'll be reading Seneca soon.. Besides, Sunday's my birthday! I would love to win this one, thanks for the chance! Would love to participate. Just discovered your website/facebook group recently. Interested to know why you picked this book? Hard to find such treasures in Tel Aviv! thanks! Not sure if you accept non-US entries? Trying my luck anyway! Cupid - of course. Unless otherwise noted, all giveaways are open to everyone.